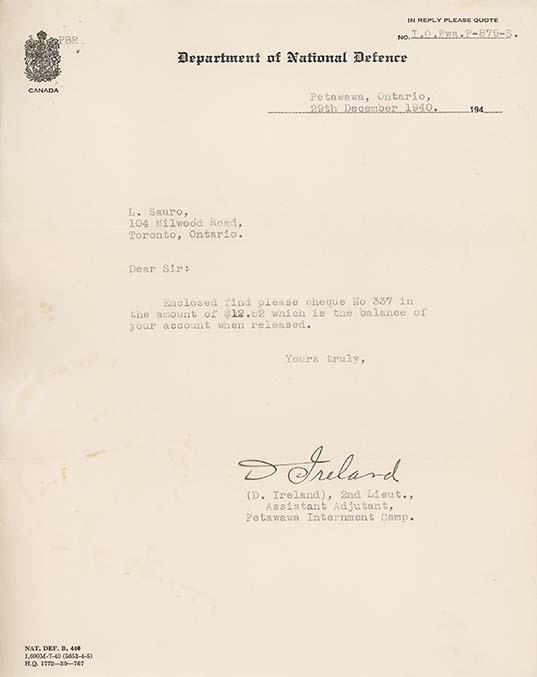 Letter from Department of National Defence, to Libero Sauro, December 29, 1940. While in camp, internees who were under sixty years old did manual labour or vocational work. Manual labour included road repair, chopping wood used for cooking and heating, and maintaining the camp. Vocational work involved trade or professional tasks. Others worked where they were needed. For instance, the camp kitchen was staffed by chefs or cooks as well as others with no experience in food preparation. Internees did not work every day. Internees were paid twenty-five cents for a day’s work. This money could be used to purchase items from the camp canteen such as toothpaste and cigarettes. Family members were also able to send money for the internees which was credited to their camp accounts. On their release, internees were issued the balance from their accounts.